This page shows further images of ectomycorrhizas and also describes some further features of this type of mycorrhizal symbiosis. 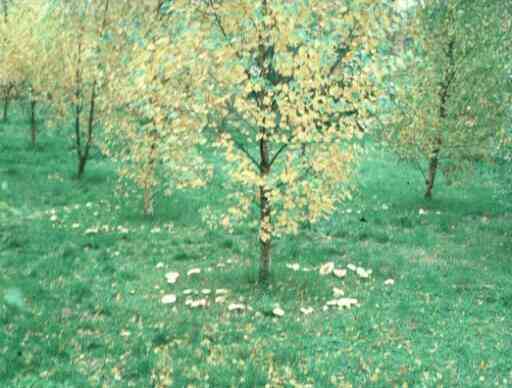 Toadstools of ectomycorrhizal fungi (Hebeloma and Lactarius species) around the bases of birch trees. 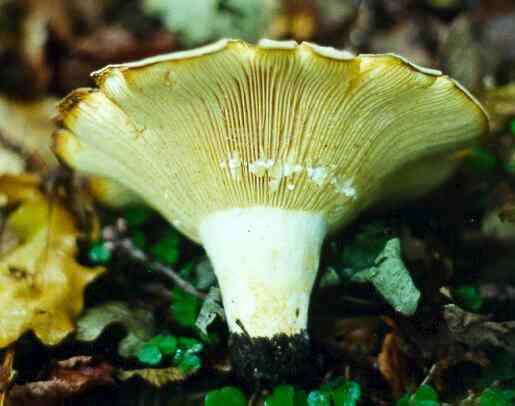 Fruitbody of Lactarius. The gills of this toadstool were cut to show that the fungus exudes a milky fluid when the tissues are damaged - hence the name 'Lactarius'. 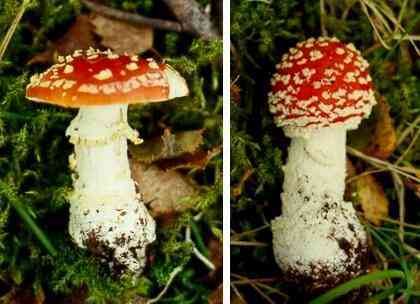 Fruitbodies of Amanita muscaria (the 'fly agaric') which is a typical mycorrhizal fungus of birches but also can be found on some other trees. Ectomycorrhizal roots. The terminal branches of the root system are highly modified - the roots are short and stumpy, covered with a mantle (sheath) of fungal tissue and there are few or no root hairs. 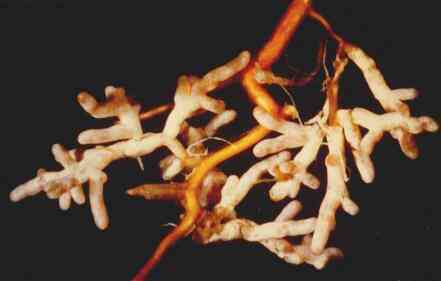 The fungus takes over the normal nutrient-absorbing role of the root hairs. 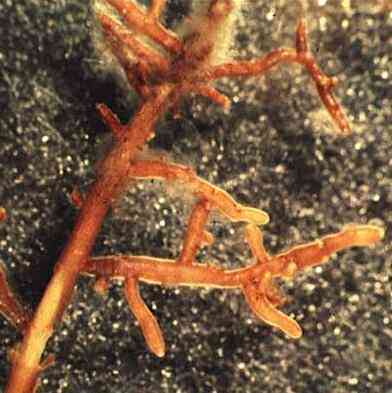 The fungal mantle is less conspicuous than in the previous image, but the fuzzy appearance of the roots is due to many fungal hyphae growing from the mantle into the soil. Such roots are seen easily if the undecomposed, surface litter is scaped away from the forest floor to reveal the decomposing litter containing a mass of mycorrhizas and their fungal networks. 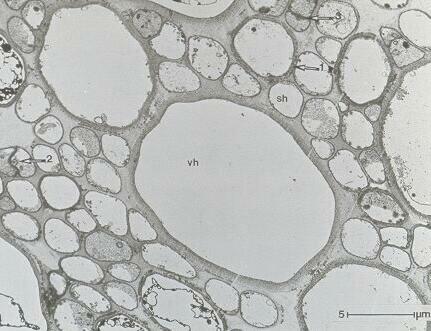 Cross-section of a pine mycorrhiza, showing the substantial fungal sheath that encases the root. The section was stained to show phenolic compounds (red) that often are formed in pine roots in response to mycorrhizal infection. They might have a role in limiting the fungal invasion of the tissues. 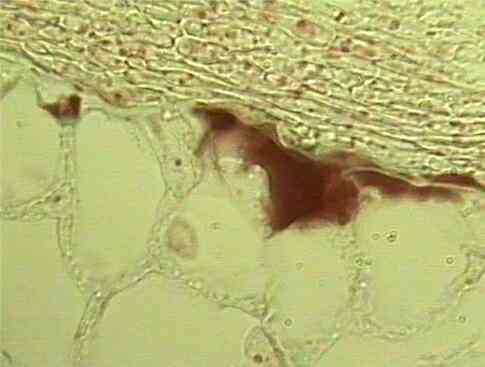 Higher magnification of the sheath (left side) composed of a tightly packed fungal 'tissue'. From the inner side of the sheath, the fungus grows between the root cortical cells, forming a network termed the Hartig net. The section was stained to show phenolic compounds (red) that often are formed in pine roots in response to mycorrhizal infection. They might have a role in limiting the fungal invasion of the tissues. 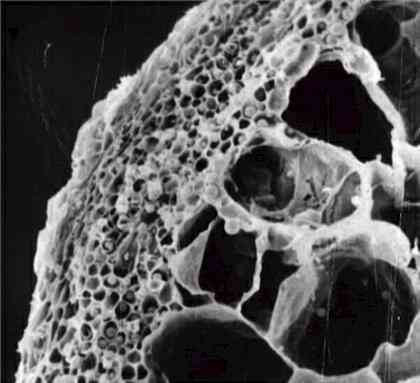 Scanning electron micrograph of part of an ectomycorrhizal root tip, showing the multilayered fungal sheath (left) and extension of the Hartig net between some of the outer cortical cells of the root. Courtesy of Dr Frances Fox. 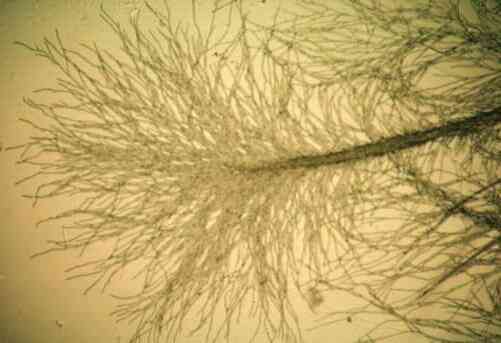 Mycelial cords (also termed mycelial strands) are specialised differentiated structures consisting of linear aggregations of hyphae, usually bound together in an extracellular matrix and consolidated by hyphal fusions. 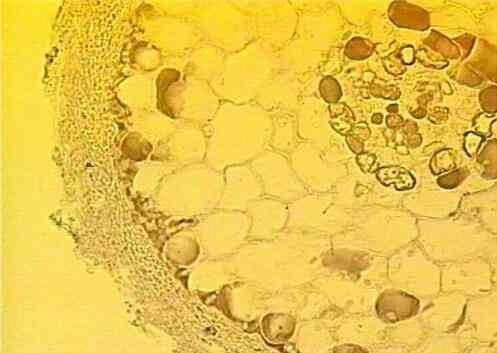 They develop usually in response to nutrient stress and, in their mature regions, are composed of wide, empty "vessel hyphae" surrounded by narrower "sheathing hyphae". Mycelial cords are capable of conducting nutrients over long distances - for example, to channel nutrients from a hyphal network to a developing fruitbody, or to enable wood-rotting fungi to grow through soil from an established food base in search of new food sources. For ectomycorrhizal fungi they also can serve to channel water from the deeper, moister soil zones to the roots nearer the soil surface, and they can help to spread infection by growing from established clusters of mycorrhizas to uninfected parts of the root system. Mycelial cord of the ectomycorrhizal fungus Lactarius pubescens, growing across a nutrient-poor agar plate. 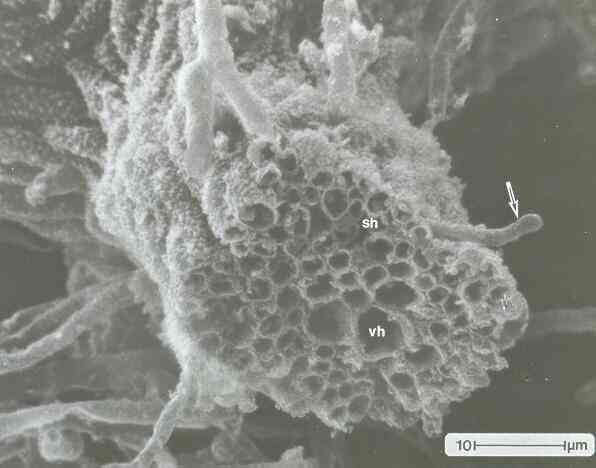 Note that many hyphae are aggregated into a thick, cord-like structure, but the hyphae fan-out from this cord in search of nutrients at the margin of the agar colony. Return to Mycorrhiza main page?